Everyone knows you can’t start a commercial-scale farm from scratch without having strong financial backing from family — especially if you’re a city boy. However, somebody forgot to give Scott Thom the memo. His experience shows that while it’s difficult for someone from the city to start farming, it’s not impossible. 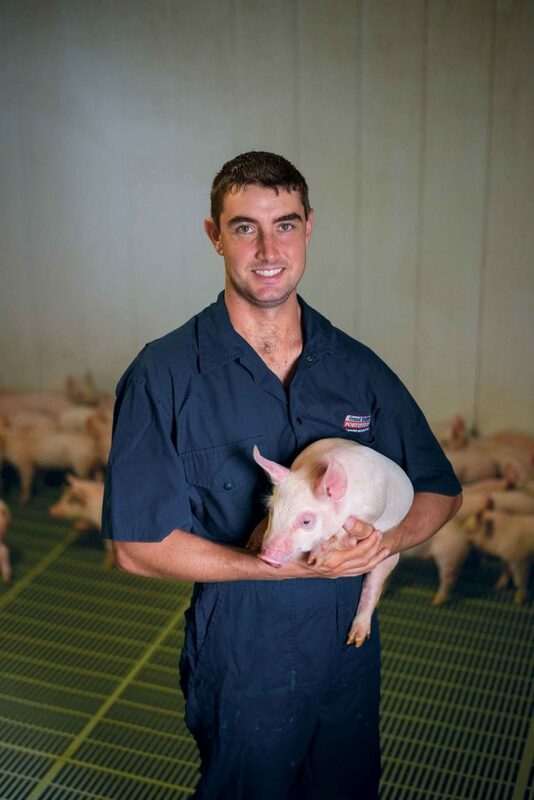 Starting with a negative net worth, the Denfield, Ontario, farmer turned a micro hog operation, marketing 15 pigs a week, into one of Ontario’s fastest growing feeder hog operations in less than a dozen years. He now markets 600 hogs a week and crops over 1,000 acres. Thom convinced a retired uncle to rent him an empty hog barn and then worked all summer to get it ready to house pigs on straw bedding. He swapped labor with a friend’s father for feeders and bought 300 weaners (weanling pigs) from his future in-laws. Thom’s venture grew rapidly. By 2007, the year he married his wife Katelyn, his cash flow and a reputation for paying his bills on time convinced Farm Credit Canada (FCC) to lend him the money to buy his first 800-head pig barn and the adjoining farmland. It was good timing because his uncle was selling the barn he’d started with. He also rented another 350 acres of farmland and a barn with 2,200 head capacity from a widow shortly afterwards. All told, he expanded by 1,000 percent in just two years. Scott succeeded by starting small and building a strong track record that showed he had the management skill to handle the debt he took on, says Larry Martin, an internationally renowned agricultural management trainer and the principal instructor with of the CTEAM program based in Guelph, Ontario, and Donalda, Alberta. Then once he proved to lenders that he could handle one level of debt, they were willing to back him at a higher level. Scott Thom built a commercial hog and cash crop farm in Ontario by leveraging his cashflow to finance growth. The couple faced a major setback in 2012 when they lost the barn and the land they rented from the widow when she sold out. It turned out to be a blessing in disguise because it forced them to step back and think about their future. So in 2013, after careful thought, they decided to buy a lot more pigs and expand rapidly, even though the hog sector’s future looked pretty bleak at the time. But when they approached their lender for the funds to stock and operate all the barns they had lined up to rent, their banker questioned their wisdom. Selling them on expansion when the industry was wallowing in red ink wasn’t easy, but Thom’s business plan, his track record, and passion convinced them to back him. Overnight he went from shipping 40 hogs a week to 600, and increased the number of acres of corn, wheat, soybeans, and dry beans he was cash cropping to over 1,000 acres. By chance, he timed the market turnaround in 2013 perfectly. Swings in commodity prices, have made the past year challenging for the couple. But Thom closely monitors their cost of production to minimize losses through the low in the price cycle and plans to continually keep growing the operation.